The eyes strongly gazing into deep behind. But in the same time, the mind is flowing over the air. A beautiful poetic response, Yoshizen. Thank you. Nothing less than glorious! That third image sends my imagination absolutely reeling! Thanks so much, Elena. It is a tucked away place that is a little tricky to get to and it’s often quite breathtaking there. Really excellent and mind blowing, the gift of Nature! Thank you. Yes, the gift of nature for sure. We live in a truly amazing world. Yes, vastly different but no less beguiling. Thanks very much, Merilee. Another smashing photoshoot – I particularly like number 3 ! 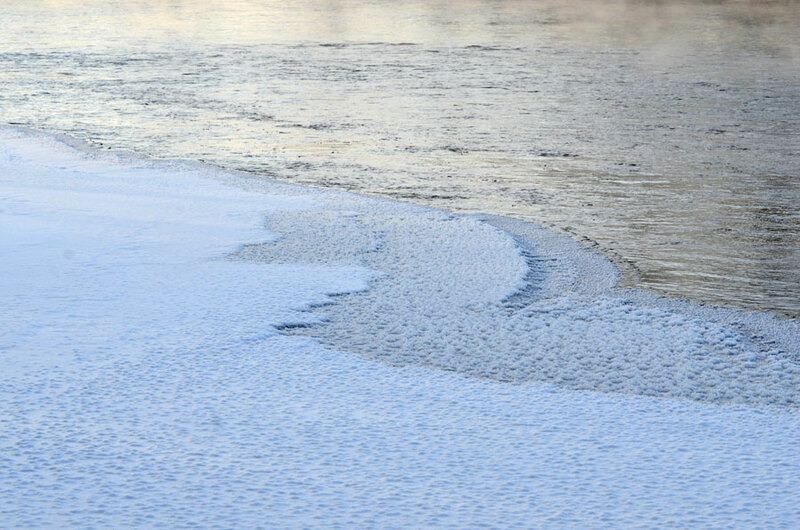 Re the cold spell – it’s affecting us in the UK as the jet stream is causing storms and some pretty horrendous flooding everywhere ! So let’s hope it warms up just a little for everyone’s sake ! Best Wishes C ! I have heard there is some difficult weather there. Best wishes to everyone affected. All of them are gorgeous but, for me, the fourth, sixth and tenth are especially good! Thank you, Jesús, much appreciated! I love the cold weather opportunities for photography. Really wintry magic pictures! Awesome! Thank you, Alexander. There is lots of beauty to find if you are dressed for it. You’re so subtle with light ! A real delight. Beautiful, otherworldliness to this set of images. Winter with snow and ice is a world I do not know but can appreciate from your images without the cold. Love, love the close ups. Hi Lee, thank you. I do love the magic of winter – it requires lots of layers, though! 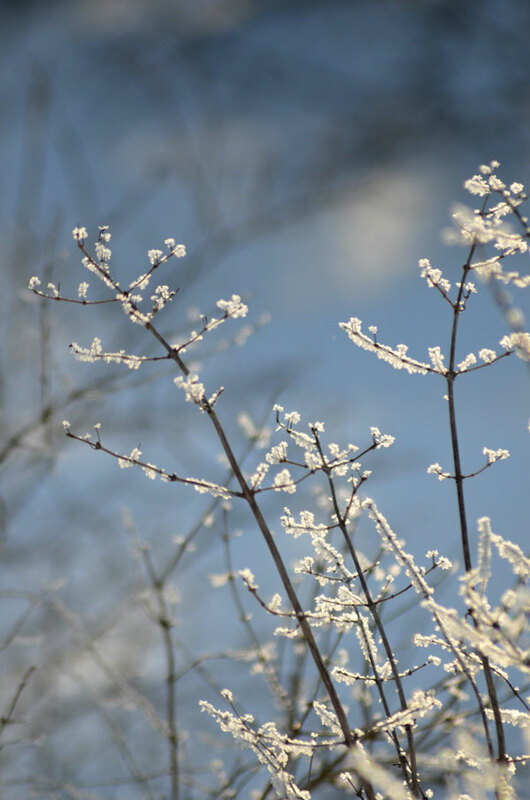 Frosty blooms, great tree pictures. Yes, it was quite frosty for a few days. not too bad today, though. Is the winter just slow to come this year? 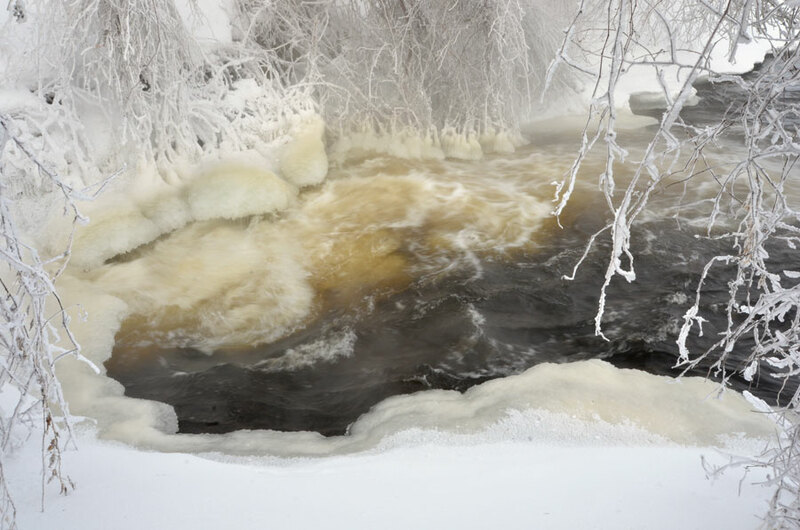 I love your winter photographs of Finland, I hope you get real winter soon! All beautiful. So many warm colours you have discovered in all that frozenness. That one with the fog- I half expect Odin to pop his head up out of the water. Or celestial ocean. Looks like a mystical journey. Celestial ocean – I like the idea of that. The nature gives us so much beauty:) This looks amazing but cold. Artistic photos! Yes, cold it was! But the cold creates a bit of magic so I can’t resist. Thanks very much, I’m happy you like them. Thank you Anthony. We are surrounded by all sorts of possibilities. Karen, the series of photographs is fantastic. Do you know how is called the bird? 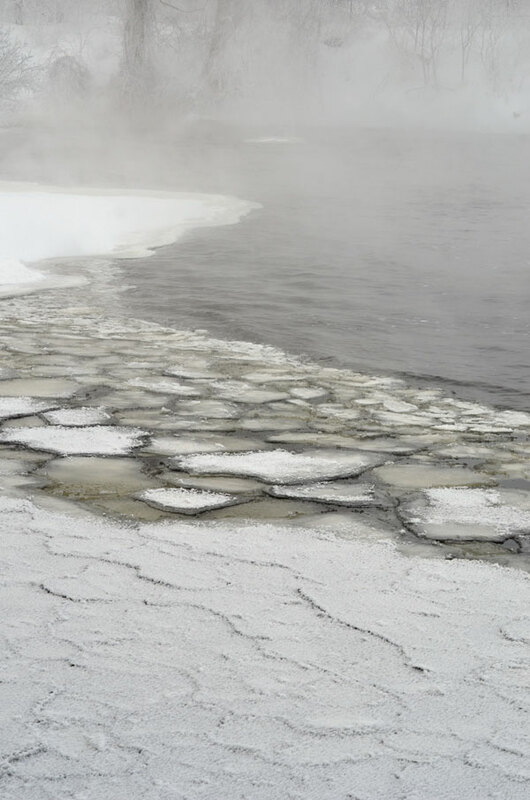 Does hot springs between the ice? The bird is called an American Robin. Most of them migrate south in the winter but in the past few years I have seen small flocks of them all winter. 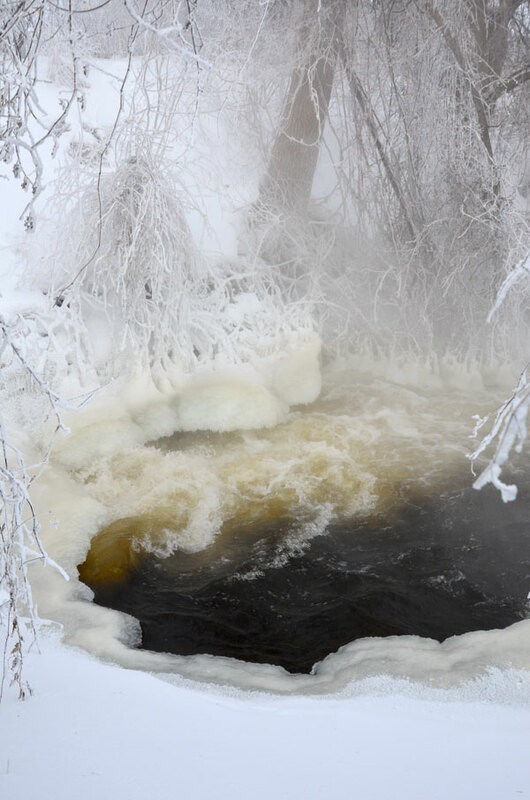 There are no hot springs in any of these photographs, the air is just so cold ( -26 Celsius ) the water appears to be steaming – the water is cold too, though, but the moving water at the rapids doesn’t freeze over like the rest of the river. 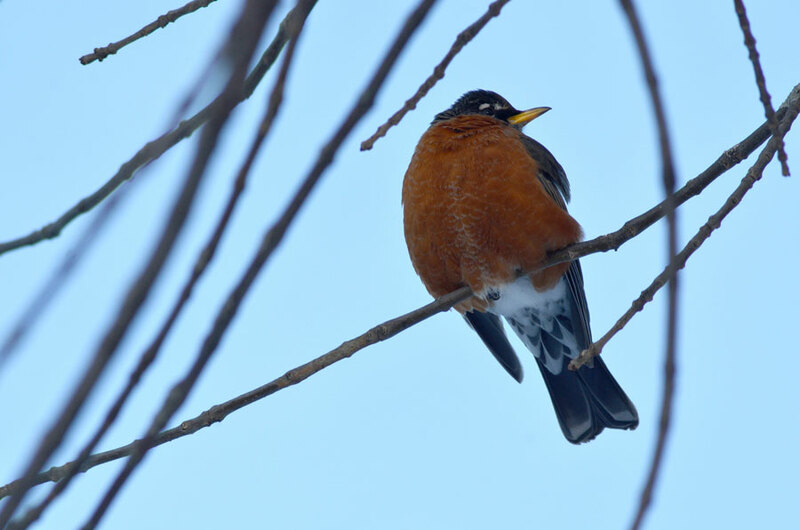 American Robin is: Turdus migratorius!! Spectacular pictures. The ice on the branches look like white glistening berries (my favourite). Thank you, it’s been pretty beautiful around here! Fairytales, storybooks, every one..I love how your winter creeps in, each branched touched with icy fingers..fills my heart with joy visiting here! Great series. These photos look harsh and soft all at once, I just love them. I especially like the 7th and 10th photos and the plant in them — sumac? Just guessing because of the fuzziness of the branches. Thanks very much, Sarah. Yes, you are right, those are sumac branches all fuzzy and frosted. Such otherworldy trees. Your photographs transport me into their midst. Hi Kathleen, happy new year to you, too! Thank you. Our real cold has slipped away today and now we’re having freezing rain. I hope it warms up for you soon. A beautiful sequence of images. The robin was a wonderful surprise. Hi Cynthia, thank you, there is lots of beauty out there to find. Yes, the robins; I’ve been seeing them the last 3 winters but it still surprises me that they stick around. It must be a very hard winter for them. It was -30C for a while last week. Lovelyu, lovely, lovely. I can even feel the cold making these beauties. Make me long for the cold which we don’t really have just now.. And looking forward for the Karen-2014! Thank you, Bente. I look forward to some more of your wintery cold photographs. Best wishes for the new year! These images are absolutely intoxicating…Superb! I could just live in them. You would have to dress fairly warm, Autumn Jade! Thanks for your comment, I’m glad you find them interesting. 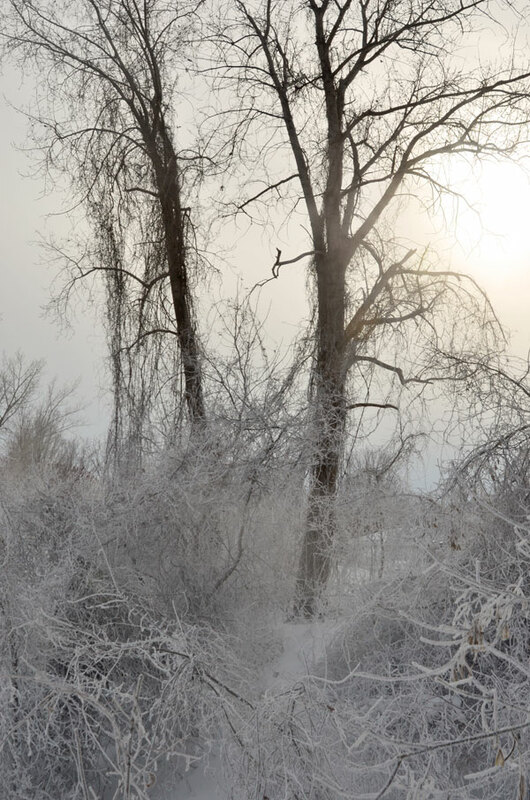 Wow, just love the lighting and the crisp white of winter that comes through in your photos. Very inspiring for the new year. Wish you the best in ’14! Thank you, Randall. I do love the winter landscape. Best wishes to you also! 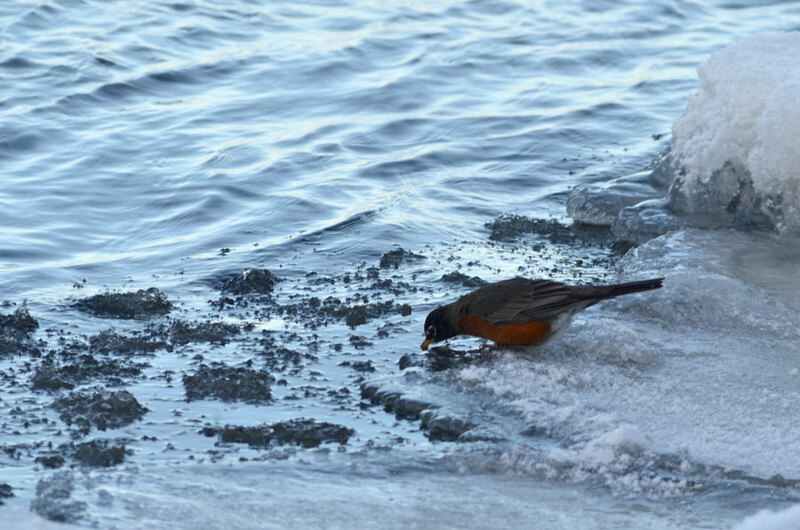 I don’t know if anyone does winter as well as you – and the Robin really made it extra sweet. Yes, the robins looked pretty cold all puffed up! 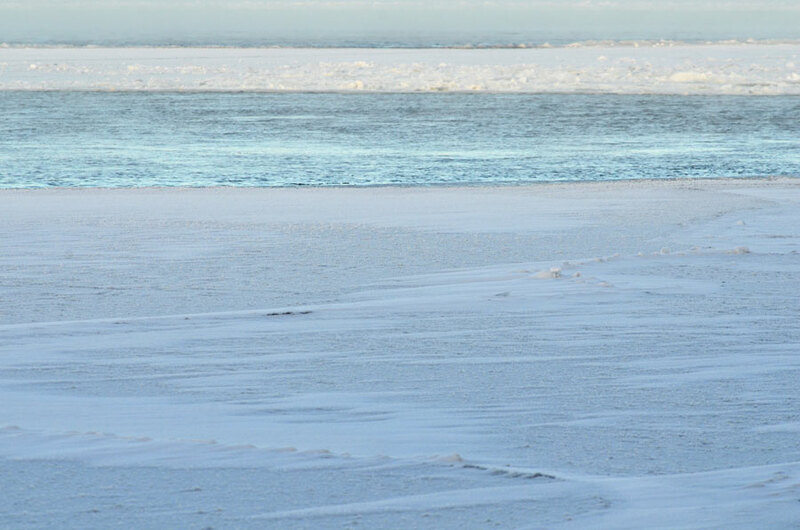 I can see exactly why you enjoy making your pictures at this time of year – it looks breathtakingly cold! There are so many colours in white aren’t there? We are on a weather roller-coaster today! It was well above freezing for a while and tonight we are supposed to plunge back down to -23c. I wonder what tomorrow will look like? The way snow transforms the landscape always fascinates me. This takes our breath away! We long for the cold and you bring it to us. Thank you so much! Hi Dina, thanks very much! Best wishes to you, “the fabulous four”, I hope you are enjoying the start to the new year. 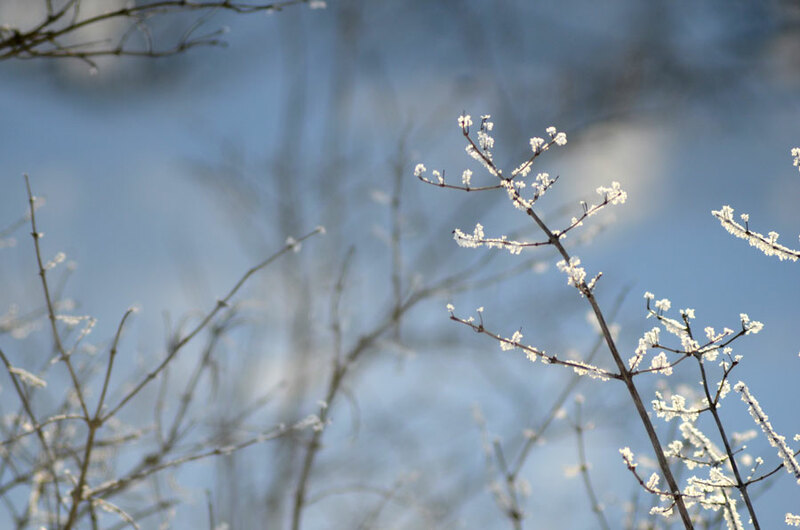 Extreme cold brings everything into the sharpest of focus. Love it! I love the way you sequenced these, Karen – orchestral swells, plucked strings and bird calls. Beautiful. Thanks ever so much for your lovely string of words, Richard. It will be close to -41 degrees with the windchill tomorrow – Toronto will probably look a lot like these lovely photos – icy! Yes, the temperature is quickly dropping here too. Be careful out there, Mona. Beautiful images. I’m particularly entranced by the fourth image. It makes me want to push back the branches and see what is beyond…hope you’re staying warm! Thanks very much, Micka. Its warmed up here quite a bit, but I do have many layers for those cold days. Wonderful, Karen. 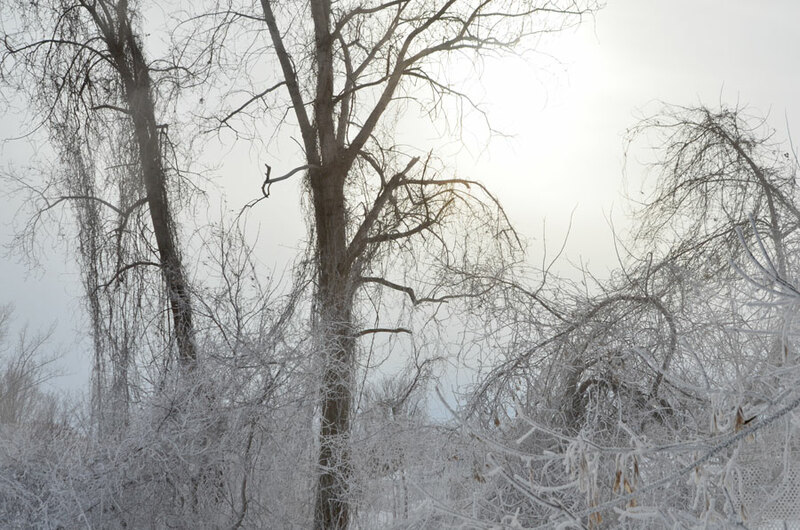 Love the backlit ice particles and your trees…always. Thank you, Jane. Yes, happy new year to you, too! Thanks, Adrian. What would we do without ‘weather’!? I’m surprised to see you have robins. We don’t have them here until spring. I hope they will survive in this very cold weather. Usually at this time of year we have common redpoll but they’re not here yet. Thank you, Jocelyne. Yes, the robins are surprising but some of them seem to have expanded their wintering grounds. This is the third winter I have seen flocks through even the coldest spells. These are absolutely breathtaking! I’ve always wanted to shoot photos of snowfall, but never know how to make them look interesting. Thank you for the inspiration. Thanks very much for your kind comment! I hope you get out there and make some winter images. A wonderful series of photographs. I always love your delicate colour palette and the softness in it. Simply beautiful. I wish you all the best in the new year, Karen. Thanks very much, Otto. Best wishes for the new year to you, I hope it’s a creative one! nature is an incredible artist! 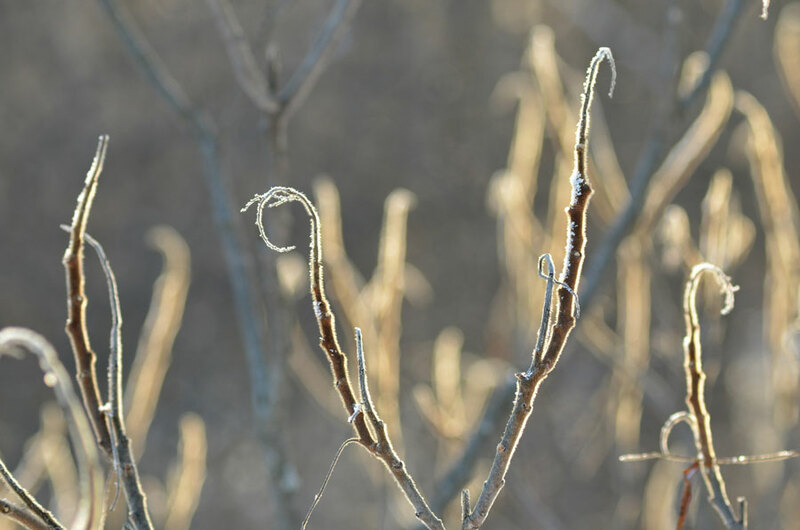 especially in winter, the nature can be magical, sophisticated and unique. the snow and ice make of nature compelling landscapes and some unique pictures. you made them unforgettable, by making incredible winter photography of them. wonderful! I agree, nature is often astonishing. I love winter for its gorgeous beauty. Thanks very much! 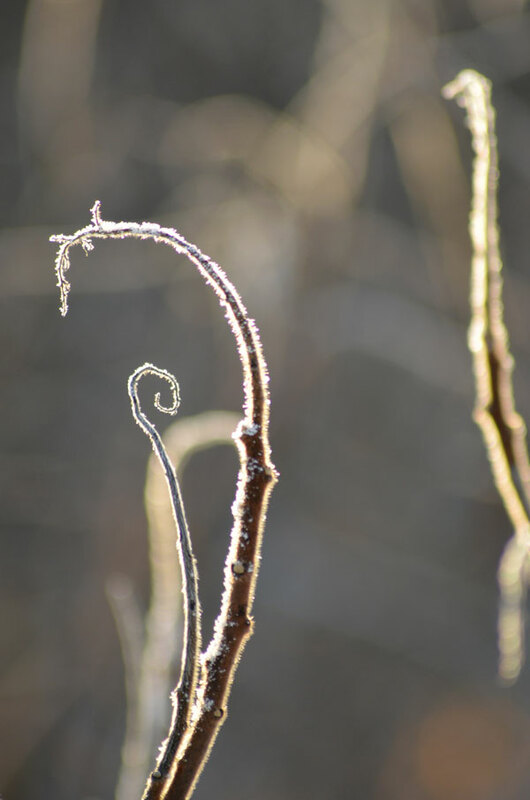 Light and composition… breath taking photography (beside breath taking temperatures). awesome feeling of the winter ! I like the sequence here. Somehow it really looks cold! I’ve been in a bit of a fairytale world lately, and these photos fit perfectly. Lovely! And I agree with you, this time of year is such an exciting time to take photos.